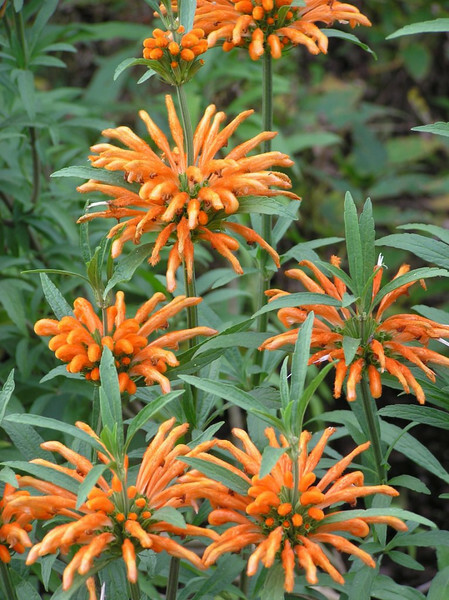 Leonotis leonarus (Lion's Tail) - An erect evergreen shrub to 4 to 6 or more feet tall by nearly as wide with a branching woody base that produces many erect stems bearing dark green 4 to 6 inch long narrow leaves. From late spring through fall appear the fuzzy orange curved tubular flowers. Plant in full sun in a well-drained soil. This plant is drought tolerant but can tolerate and thrive with regular irrigation and it can survive temperatures down to 20 degrees F and if it freezes back in the winter, it is known to attract birds, bees and butterflies to the garden.